Airservices is Australia's air navigation service provider - we provide air traffic control, aviation rescue and fire fighting and air navigation services. I, Air Chief Marshal Sir Angus Houston AK, AFC (Ret’d), as Chair of Airservices Australia, present the Airservices Australia 2018–19 Corporate Plan, which covers the periods of 2018–19 to 2022–23, as required under section 35(1) (b) of the Public Governance, Performance and Accountability Act 2013 and Section 13 of the Air Services Act 1995. I am pleased to present the Airservices 2018–19 Corporate Plan. This Plan has particular significance for me as it is my last as Chair of Airservices Australia. It provides a blueprint to be passed on to the next generation of leaders as they support our customers to navigate an exciting future. This year’s Plan outlines how Airservices is building on the strong foundations laid in recent years, to evolve how we support our customers and industry to meet both current and future needs, in a rapidly changing aviation environment. The factors influencing air space management over the next five years have never been so diverse, complex or exciting. Aviation has always been an industry that thrives on innovation, but the coalescence of technological advancements, globalisation and increased customer expectations is providing an unprecedented context in which we must continue to deliver safety and service excellence. Building on the significant work done internally on our business fundamentals in 2017–18—with a new operating model, matched with updated organisational values (championing customer centricity and innovation) and a return to a sustainable financial position, we are both optimistic and focused on preparing for this future. In February 2018, we were pleased to make a significant advance into this rapidly changing environment, with the signing of the OneSKY contract to deliver the most advanced air traffic control system in the world. This milestone is significant—many years in the making, in collaboration with the Department of Defence, it signals the achievement of civil military air traffic harmonisation in our region. This is the most important development in the safe management of Australia’s skies since the dawn of Australian aviation. Work is well underway, with the benefits being delivered progressively over the roll-out period. OneSKY is our most important platform from which to deliver value to our customers, and this Plan speaks to how we will achieve that now that OneSKY is a reality. As always, customer needs are prime, and customer centricity is embedded in both the Airservices’ values and operating model. Customer-centricity will continue to drive decision making in both the Service Excellence pillar (delivering with excellence what we do now) and Service Innovation pillar (new ways to deliver, and new service areas to add value) of our 2018–19 Corporate Plan. While firmly focused on the delivery of OneSKY for our customers and partners, we are also preparing for the future context in which it will be delivered. That means working with industry to understand the changes we are all facing. It means bringing an expert voice to regulatory and policy considerations, and sharing information and expertise to enhance understanding, foster and grow civil aviation and provide the opportunity for further innovation. These elements are captured in the Industry Leadership pillar of our strategy. Of course, the basis from which we will achieve these ambitions is the organisation – the people, culture and processes that facilitate the outcomes we exist to deliver. We need to continue to build a culture founded on the pride and sense of responsibility that we all have in the important work we do, and engage our people within an agile and technology-enabled organisation, ready to navigate future change. As we are funded by the industry, we remain ever cognisant of our duty to provide value, through valued services, efficiently delivered. We are pleased that our prices have been held unchanged for three years, reflecting the value delivered from our internal efficiency improvements. This Plan demonstrates our commitment to continue to deliver that value, and look to innovate and improve, all at no additional cost to industry—clear evidence of our commitment and capability to achieve continuous improvement through a customer value lens. This year you may notice that we are expanding the frame of reference of our Corporate Plan so that it presents a more comprehensive picture of the full range of activity Airservices undertakes, not just a view of in-train initiatives and projects. I am proud of the depth and breadth of what this organisation has achieved, and delivers on a day to day basis. Our vision for the future is laid out in the following pages. I have been privileged to lead as Chair of this great organisation for the last six years. I wish my colleagues on the Board, and every individual at Airservices, all the best as they work to deliver on this plan and fulfil the ongoing potential of Airservices to add real value to aviation in Australia, our region, and beyond. Our purpose is to provide safe, secure, efficient and environmentally responsible air navigation and aviation rescue fire fighting services that are valued by the aviation industry and community on behalf of our owner, the Australian Government. We operate in accordance with the requirements of the Air Services Act 1995 (the Act) and the Public Governance, Performance and Accountability Act 2013 and in response to the Government’s Statement of Expectations (Appendix A) issued as a notice of strategic direction to the Board of Airservices Australia under Section 17 of the Act. A key legislative obligation under the Air Services Act 1995 is to foster and promote civil aviation. In fulfilling this obligation in an ever changing operating environment, our service delivery must not become an operational or economic impediment to the growth of the aviation industry. With the operating environment for global Air Navigation Service Providers (ANSPs) changing at such a rapid pace, we closely monitor emerging trends and developments so that we can continue to discharge our responsibilities to keep air travel safe, and support our customers with efficient services. Our industry continues to grow—by 2030, Australia’s capital cities will support 235 million travellers each year. The biggest growth is from China (5.6% growth per year), the rest of Asia (3.5%) and North America (4%). By 2035, over 130 million passengers from China and over 105 million passengers from North America are expected to travel to Oceania every year. These forecasts are supported by trends we have observed in our key market segments over the past 12 months. Specifically, there has been an increase in the number of flights we manage in our emerging markets of North Asia and the Americas, and our traditional Middle Eastern market. Further, Australia’s capital cities will support 2.3 times more passenger movements from 98.3 million passengers in 2009 to 235 million by 2029. This will be supported by nearly twice the amount of aircraft movements from 1.09 million in 2009 to 1.7 million in 2029. The global drone market is also expanding rapidly. From 150,000 drones globally in 2016; by 2031 there are expected to be 24 million drones in the skies. This growth will be accompanied by an increase in economic activity, with drone spending estimated to be over US$3.1 billion in Australia alone between now and 2021. As the global aviation market continues to change, Airservices must evolve in order to continue to deliver on our purpose and vision. Early in 2018, we signed the OneSKY contract to deliver the most advanced air traffic management system in the world. We need to both deliver OneSKY and actively prepare for the future context in which it will be delivered. This year’s Corporate Plan explores some of the emerging factors that are shaping both what and how we deliver to customers, so that as we plan for the next five years (and the decades beyond that), we remain as relevant, efficient and valued as possible. Looking ahead—What is happening in the aviation industry? Rapid disruption is occurring—our skies will start to look different between now and 2023, the five year period covered by this Plan. Technology is reshaping how we perform our important roles in air traffic control and aviation rescue and fire fighting. The risk profile is changing. There will be more complexity, more connectivity and more tools at our disposal to deliver innovative and valuable outcomes. The key themes for our industry (and their implications for ANSPs like Airservices) over the next decade, for which we must prepare now, are detailed in this section. As the magnitude of air travel continues to increase, airspace will need to be harmonised across flight information regions to improve efficiency. Air navigation services will be required to be delivered based on operational needs, rather than constraints of national boundaries. These changing circumstances will require enhanced cooperation between States and key industry players. Providing support for airport infrastructure projects to release incremental capacity and manage the increase in traffic, which is currently causing capacity constraints, will continue to be required to manage the environmental and other impacts of an increasingly congested airspace. Over the next decade, traditional (including ultra-long haul) and non-traditional vehicles will operate alongside each other, increasing the congestion and complexity of airspace. Vehicles are expected to occupy both regulated and unregulated airspace (including above 65 000 feet and below 400 feet). New models of air traffic are likely to emerge, including models that include the principle of a sharing economy. There is a growing requirement to integrate controlled and uncontrolled airspace to ensure safe air traffic operation within increasingly congested skies. ANSPs must work effectively with regulatory bodies to balance aviation industry growth and safety. This will require ANSPs to proactively form a forward-looking view on policy and regulatory change which accommodates anticipated growth, maintains safety, and ensures resilience and security. As data is able to be more readily captured, it will form an increasing critical role to support operational efficiency and effectiveness. Information management, and the insights it captures, will form core value propositions to businesses. Artificial Intelligence (AI) and Virtual Technology (VT) have the potential to significantly increase operating efficiency. Leveraging new technology will create opportunities to improve overall performance, productivity and safety, as well as opening up potential for more innovation. Integrating these technologies with existing capability will increase system complexity and requires a measured transition between old and new systems to achieve intended benefits. New entrants are bringing unique propositions and business models (e.g. telcos and their communications networks) to the global aviation market. Incumbents are looking to expand along the value chain (e.g. manufacturers working with other players to co-develop self-navigating technology). Strategic partnerships will become critical for ANSP success. Industry players will race to provide end to end customer experiences by vertically integrating travel. Organisations will need data, and the business insights it provides, to create hyper-personalised services for customers. What does this mean for Airservices? We need to proactively assess and adapt to these changes to ensure we continue to provide safe, secure, efficient and environmentally friendly services to the aviation industry. For our traditional, regulated services this means actively supporting our customers to increase capacity during all phases of flight to enable them to continue to optimise and enhance the customer experience. OneSKY, Airport Collaborative Decision Making (A-CDM), and Long Range Air Traffic Flow Management (LR-ATFM) are key to achieving this outcome. An emerging area of focus will be to evolve our information services, and build relationships with strategic partners across the value chain. The growth of new, non-traditional vehicles will also bring specific challenges in how they should be managed and safely integrated with existing traditional operations. Over the life of this Plan, we will work closely with regulators, our customers, government and non-traditional operators to ensure this important new segment of the aviation industry is supported to grow, safely. Building on our strong foundations laid in 2016–17, our focus in 2018–19 and beyond looks to the future of our industry. Detailed in our Strategic Pillars and Initiatives, we are focused on what our customers value and expect, our operating environment, and the challenges and opportunities of technology and trends in aviation and air safety globally. During 2017–18 with planned investments in OneSKY and new technologies such as Airport Collaborative Decision Making and Digital Aerodrome Services progressing, our organisation is now evolving its focus from internal efficiency to industry contribution. We are now well placed to deliver value through service excellence and innovation for our customers, to help them to navigate the challenges and opportunities of technology and respond to trends in aviation and air safety globally. 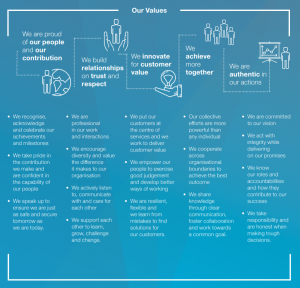 With a new customer-centric operating model in place, we reflected on our core principles and, with the input of our people, updated our organisational values to reflect the more agile, relationship-based and customer centric cultural aspiration that had motivated and guided such momentous change in our business. 1. Our primary effort is invested in delivering Service Excellence to our customers. This means doing what we do now, well; to meet and exceed the expectations of our customers. It means always working to enhance the safety, agility and efficiency with which we deliver our core air navigation and aviation rescue fire fighting services. 2. We actively consider and invest in Service Innovation. This means exploring ways to enhance our existing service offering (in the near term) and exploring new potential service offerings in emerging segments of the aviation industry in the longer term. 3. We demonstrate Industry Leadership by proactively shaping and influencing policy that supports the aviation industry to grow safely. This includes contributing on industry-wide issues such as airspace and environmental management. 4. We build Organisational Agility so that we operate effectively and efficiently. Engaging and developing our people in an environment and culture in which both core business and future innovation can thrive. Service Excellence is how we meet and exceed the expectations of our customers by delivering our current services to a standard of excellence. As aviation traffic grows, it is imperative that we maintain our focus on safety and quality delivery of our Air Traffic Management (ATM) and Aircraft Rescue and Fire Fighting (ARFFS) services while continuously improving efficiency and effectiveness. Service excellence encompasses all aspects of continuous improvement across every part of our business, cognisant of our environmental obligations and rewarding the trust placed in us by the communities and the Government. OneSKY remains a critical priority and will see us realise our goal of harmonising civil military air traffic management. The program of work for the coming year will focus on finalising the system design review for the core CMATS capability, and commencing work on support facilities (including Air Traffic Service Centres) and enabling capabilities (such as the roll out of new voice communications systems in Perth, Melbourne, Sydney and Brisbane). We are undertaking a range of investments over the life of this plan to ensure that we support industry expansion and infrastructure investment across Australia. Activities under this initiative will see us deliver essential communications, navigation and surveillance facilities to allow new runways to meet regulatory requirements and increase airport capacity. Digital tower technology will deliver better safety and operational outcomes through more flexible and efficient service offerings at emerging aerodromes. We have a responsibility to protect the environment from the effects of aircraft operations. In accordance with our Minister’s Statement of Expectations, we produce an annual environmental work plan and this year we are focussed on improving how we engage with communities in relation to aircraft noise, including the assessments and analysis on which our engagement is based. We continue to implement new services to support safe traffic growth. Preparatory work for Proserpine ARFF services will be completed in the coming year, with services planned for commencement from 2019 onwards. All of the initiatives described under this pillar contribute to our performance outcomes of ‘safe and secure’, ‘valued and accountable’ and ‘efficient and commercial’. The success of these initiatives will be measured on the completion of the specified deliverables within the next 12 months and our successful progression of each program of work in the subsequent years. Beyond our existing services, Service Innovation requires that we proactively innovate and deliver new service offerings to bring value to customers in both existing and emerging sectors of our industry. The pace of change in aviation requires that we enhance our ability to build and deploy new services and information capabilities, for both traditional and new airspace users. Through this innovation, we will make a further contribution to growing the aviation industry, beyond the safety outcomes we currently deliver. In the near term, service innovation will focus on activities that will enhance the traditional ATM offering (e.g. LR-ATFM and A-CDM) to deliver new value and release incremental capacity at airports. In the longer term, this may expand to encompass identifying and exploring new service requirements in emerging segments of the aviation industry or opportunities to add value in new areas of the aviation value chain. We will look to further integrate within the industry, to maximise the benefits of interconnectedness and to work in new ways across the aviation ecosystem, anticipating and able to meet customers changing needs. A-CDM is a cross-industry initiative with the potential to realise major savings to the aviation industry over the next decade. Building on the operating and governance work we completed last year, this year will see the initial implementation of the A-CDM system (with Brisbane, Sydney, Melbourne and Perth all targeted for this year). This year we shift from developing a concept of operations for LR-ATFM to commencing implementation. LR-ATFM shifts some or all of the required airborne delay for long range flights from the arrival phase of the flight to the enroute phase, resulting in less fuel burn and improved predictability of arrival flows into our major airports. In the out-years of this plan, Airservices will also invest in building on the capability delivered by A-CDM and LR-ATFM to further improve network management. This will include continued focus on minimising off-route constraints, improving the flexible use of airspace and implementing a collaborative connective forecasting capability. Implementation of our information strategy will see us invest in a standardised enterprise solution (including a workbench of tools, platform, support and processes), supporting data management, business intelligence and analytics, data warehousing, and data lake components and tools. This capability will provide the necessary integration, real-time data provisioning, self-service, and security capabilities to support System Wide Information Management (SWIM). All of the initiatives described under this pillar contribute to our performance outcomes of ‘efficient and commercial’ and ‘innovative’. Our investment in this space is focused directly on ensuring that we proactively build the capabilities required to provide our customers with the operational flexibility they need to be successful and with services they value as the industry changes and grows. The success of these initiatives will be measured on the completion of the above deliverables within the next 12 months and our successful progression of each program of work in the subsequent years. One of our key legislative obligations under the Air Services Act 1995 is to foster and promote civil aviation. It’s why we place critical importance on not being an economic or operational impediment to industry growth (evidenced by the value we have returned to customers in recent times with no change in funding requirements). Our role in fostering and promoting civil aviation challenges us as an industry leader, to continually look for ways to be more proactive across the entire aviation ecosystem. This leadership will be exemplified by proactivity; anticipating changes rather than responding, and bringing together stakeholders from across our industry to navigate through inevitably complex issues. This collaboration will support industry growth, as together we create an environment in which the aviation industry thrives. Throughout, we will ensure representation of all layers of our industry—airlines, regional operators and general aviation users—and the communities and citizens who we ultimately protect. This pillar continues our established role in managing and evolving Australia’s airspace to balance competing demands of growth, technical change, consumer expectations and environmental consideration. It reflects the requirement for us to shape policy and collaborate with industry stakeholders to foster safe and secure industry growth in the future. We fulfil our role in the management of Australian airspace in accordance with the Government’s Australian Airspace Policy Statement, which requires us to, among other considerations, consider the safety of air navigation, the current and future needs of the aviation industry, and take advantage of technologies wherever practicable. In 2018–19 we will work with the Civil Aviation Safety Authority to standardise the services provided in both Class A and Class E airspace across Australia, increasing consistency for airspace users. We will also commence the trial of lowering the base of Class E airspace, which was initiated in 2017–18. This trial will be carefully managed to protect the safety of air navigation, while leveraging new technology to increase airspace accessibility. All of the initiatives described under this pillar contribute to our performance outcomes of ‘valued and accountable’, ‘efficient and commercial’ and ‘innovative’. Our aim is to bring the disparate requirements and priorities of our entire stakeholder group together to provide a leadership role across the entireecosystem. We need to ensure that we continue to set the internal conditions for service delivery and future innovation to thrive. This means continuing to develop a culture which is customer centric and commercially focused, with processes and systems in place to support our people to achieve long term objectives from both a Service Excellence and Service Innovation perspective. It also requires ongoing investment in enabling digital capability to ensure that as our operating model and ways of working continue to evolve to take advantage of new opportunities in new areas, our technology evolves in parallel. Our People Strategy recognises the need for fundamental shifts in our workforce capability and composition over the long-term. The Workforce Transformation Roadmap will identify and prioritise key talent segments that will be subject to transformation, identify milestones and functional accountability for clearly articulating future requirements, shifting capability through recruitment, development and certification and addressing factors that impact attraction, selection and retention of priority talent. We will enter digital workflow services into operation over the first 12 months of this plan. This capability will provide the tools, processes, methodologies and personnel required to provide an integrated and automated workflow creation service (and includes the integration of key data sources and retention compliance requirements for decisions and records). Our Cyber Security program will deliver an effective and efficient Cyber Resilience Management System (CRMS) to complement our existing Risk Management and Safety Management systems. It will promote and develop a Security Culture in Airservices’ personnel and align us with the principles of the Australian Government’s Information Security Manual and Protective Security Policy Framework standards. By updating system configuration standards and processes to ensure ongoing resilience, and implement essential security tools and capabilities to ensure we proactively protect our information management assets. Our organisational capacity and capability underpins our success across all of our performance outcomes. An agile, fit for purpose organisation is a pre-requisite for successful achievement of our service, innovation and industry initiatives. Our success beneath this pillar will be measured on the completion of the above deliverables within the next 12 months. Our strategic performance outcomes support, inform and drive our decision making. They will ensure that we continue to work towards being recognised as an industry leader and a valued service provider. Our overall approach to measuring performance reflects our commitment to achieving these outcomes. We monitor and manage our performance via a set of key performance indicators (KPIs) as outlined in Table 1. These nine KPIs are balanced against the broad criteria of safety, financial stewardship, operational efficiency, industry outcomes, and organisational capacity in order to present a holistic view of our how we are delivering on our purpose, vision and strategic priorities over time. 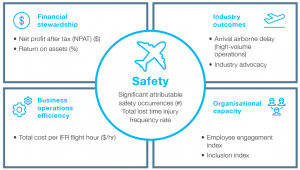 Maintaining our already strong record around significant safety occurrences and our lost time frequency injury rate clearly demonstrates the degree to which we are achieving our safety and security outcomes. 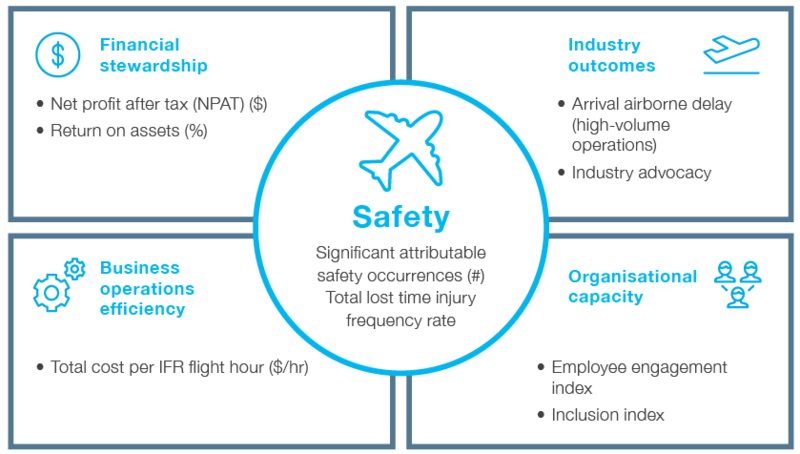 Similarly, strong industry advocacy, achievement of Net Profit After Tax (NPAT) and Return On Assets (ROA) targets, and reductions in airborne delay and total cost per Instrument Flight Rules flight hour, demonstrate directly the degree to which we are providing valuable, accountable, efficient and commercial services to our customers. Innovation is an area where measuring performance is challenging as it is a forward-looking ambition. However in the near term our innovations around A-CDM and LR-ATFM will translate to measurable improvements in the efficiency and effectiveness with which we deliver core services. 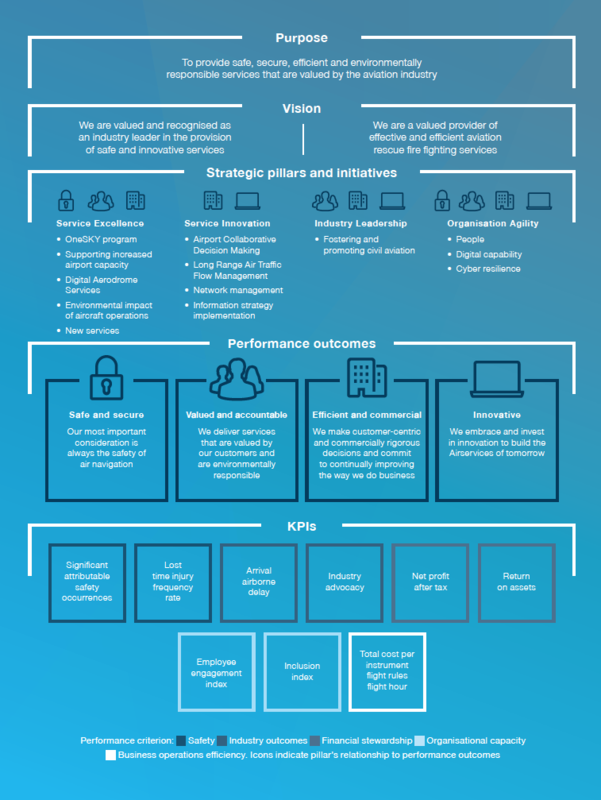 As we innovate to introduce new services and capabilities into our organisation in the second half of the five years covered by this plan, additional KPIs which more directly track the impact of our innovation will be introduced. The level of engagement and diversity our workforce represents is critical for Airservices to achieve its business objectives and is a prerequisite for success against all of our other performance goals. This five-year financial plan supports our strategy and funds key investment and services improvement programs to enhance safety and deliver value to industry. It builds on the financial performance achieved over previous years and reflects our continued focus on driving business improvements to support long term growth across the Australian aviation industry. With no price increase forecast over the planning period, it enables real price reductions of 17 per cent since the last price increase in July 2015. The plan funds our forward capital investment program, which remains focused on customer service improvements, supporting airport infrastructure projects to increase capacity while enhancing safety and business resilience. The delivery of the OneSKY program and our investment to support major airport development plans is included in accordance with the current investment delivery schedules. The five-year operating projections and performance measures are shown in Table 2. The plan reflects the latest economic outlook and airways traffic projections. We set our prices in consultation with our customers for core airways services under Long Term Pricing Agreements. Under the provisions of the Competition and Consumer Act 2010 any increase in prices must be notified to the Australian Competition and Consumer Commission for its review. We established the current pricing agreement in October 2011. It has continued to allow us to recover all reasonably incurred costs (including a return on capital employed) relating to the delivery of our services and it has provided ongoing price certainty for our customers. Today, our prices are the same as they were in July 2015. Reflecting a more efficient operating cost base delivered through our Accelerate Program, this plan maintains weighted average prices at existing rates, delivering our customers real price decreases of 17 per cent since July 2015 while providing improved service value through to 2023. Return on Assets and Net Profit After Tax are forecast at an average of 6 per cent and $66 million per year respectively. These returns are in line with price regulatory benchmark rates. Revenues over the period are projected to grow in line with traffic with no planned increases in weighted average prices. The outlook for traffic growth continues to be driven by the performance of international aviation sector on the back of the ongoing expansion of the Asian market. However, some slowing in this sector is expected, with potential short term market volatility over the planning horizon. Following consecutive years of contraction across domestic services, some signs of improvement are emerging. Expenses are forecast to grow between two to three per cent per annum over the next five years. The plan factors in the delivery of new services and improvement programs, including the expansion of air traffic control and aviation rescue and fire fighting services to support new regional east coast locations and parallel runways operations. Allowances have also been made for Per- and poly-fluoroalkyl substances (PFAS) site testing work. In line with our strategy the business continues to invest in technology and data to provide information services for the future. The financial plan caters for the investment in services and systems that ensure the delivery of new secure information services. With a once in a generation change to the new Civil Military Air Traffic Management System, the plan incorporates transition and capability readiness activities, and overlapping support for old and new systems which is required as part of the implementation of the new system scheduled from 2020–21 onwards. The five-year capital investment projections are provided in Table 3. This investment profile incorporates the funding required to deliver on our strategy across the planning years with total investment levels estimated at $1.2 billion over five years. Providing significant benefits to the customer through maintaining our safety performance, reducing fuel burn for airlines and providing dynamic information for better managing impacts of delay in a growing traffic environment are the key themes of our investment plan. OneSKY activities and associated enabling projects remain the central focus of the program accounting for $724 million, or 59 per cent, of the total expenditure. The remainder of the program will support the delivery of airport new runway developments, establish two new regional services and continue the expansion of surveillance services to improve safety and support industry growth. To improve the efficiency of the air traffic management network the program will continue to invest in information technology. Dividend levels over the first two years of the plan have been reduced to be reinvested into the business whilst capital expenditure funding requirements remain high as we deliver OneSKY, introduce new services and support major airport infrastructure projects. From 2020–21 dividends are forecast to be paid out at a rate of 30 per cent of after tax profits returning an average of $20 million in dividends each year. Through sustained levels of profitability, dividend planning and management of capital expenditure funding, gearing is projected to remain within target levels and average 42 per cent over the term of the plan. We are committed to developing and promoting a culture of active risk management supported by robust and transparent governance oversight. Our Board Risk Appetite Statement promotes risk-based decision making driven by a sound understanding of our risk environment. This assists us to meet our obligations under Section 16 of the Public Governance, Performance and Accountability Act 2013 and commitment to better practice risk management in accordance with the Commonwealth Risk Management Policy. We perform an integral role in the Australian aviation industry and operate in an inherently complex environment. Our external risk considerations include our regulators, emerging technologies, changes to the domestic and international economic environment, and our role in the broader commercial aviation industry. We have a wide range of risks associated with our operational activities. Responding to these diverse risks requires us to ensure the integrity of our safety and environment management systems and service delivery to maintain long term sustainability. We continuously improve our operating systems, embrace innovation and engage with technology to remain responsive to changes. Business risks: including ATM and ARFF service delivery, business continuity, as well as compliance with Work Health and Safety (WHS), environment and financial obligations. We are committed to, and actively apply, a continuous improvement approach towards risk management that aligns with best practice principles and is consistent with the International Standard ISO 31000:2018 Risk management – Guidelines. and decision-making processes through a clear articulation of risk tolerance and the level of risk that we are willing to accept as an organisation. Through the implementation of our Risk Management Standard, as a part of the Governance, Risk and Compliance (GRC) Framework, we proactively identify and treat risks to within acceptable tolerances in our operations and operating environment. Operational Level – application of risk assessment and management techniques to meet operational framework and management system objectives. The Enterprise Risk Report, supported by Business Group Risk Reports, are reviewed by the Chief Executive Officer and the Executive Team on a quarterly basis. A quarterly GRC Report containing contemporary enterprise risk information is also presented to the Board Audit and Risk Committee (BARC) for review and oversight. Effective reporting and oversight assists our leaders in making strategic decisions to address major threats and seize opportunities in an open and transparent way. In addition, we apply the three lines of defence model to provide assurance that our key controls are effective in managing risk. Assurance activities are layered across the three lines of defence and embedded into our processes. These assurance activities provide the leadership team, the BARC and our stakeholders with a high level of comfort that risks are being managed, compliance obligations being met and corporate objectives are being achieved. Overview This instrument is known as the Statement of Expectations for the Board of Airservices Australia for the period 22 May 2017 to 30 June 2019. This instrument commences on 22 May 2017 and expires at the end of 30 June 2019 as if it had been repealed by another instrument. This instrument repeals the previous Statement of Expectations for the Board of Airservices Australia for the period 1 July 2013 to 30 June 2015 and the Statement of Expectations for the Board of Airservices Australia for the period 1 July 2015 to 30 June 2017. This instrument puts in place a new Statement of Expectations (SOE) which serves as a notice to the Board of Airservices Australia (Airservices) under section 17 of the Air Services Act 1995 (the Act). The new SOE outlines in a formal and public way, the Government’s expectations concerning the operations and performance of Airservices. The Airservices Board’s Statement of Intent as outlined in this section responds to each element of the Statement of Expectations* (22 May 2017 to 30 June 2019) and states our formal commitment to meeting our Minister’s expectations. In addition, this Corporate Plan supports our Statement of Intent in response to the Statement of Expectations. Governance Airservices should perform its functions in accordance with the Act, which requires that Airservices must regard the safety of air navigation as the most important consideration. Airservices shall also perform its functions in accordance with the Public Governance, Performance and Accountability Act 2013 (PGPA Act) as well as other relevant legislation. Airservices should maintain high standards of professionalism, service, probity, reporting, accountability and transparency, consistent with the provisions of the PGPA Act and have a code of conduct and values consistent with excellence in the public sector. Airservices will continue to perform its functions of providing safe, secure, efficient and environmentally responsible services that are valued by the aviation industry on behalf of our owner, the Australian Government. In performing these functions, we will continue to adhere to our values and code of conduct, which assist us to maintain high standards of professionalism, customer service, probity, reporting, accountability and transparency. I expect that the Board and the Chief Executive Officer will work together to enable Airservices to operate as a world leading Air Traffic Control and Aviation Rescue and Fire Fighting Service (ARFFS) provider, backed by the requisite facilities and skilled workforce. I also expect the Board to ensure Airservices has the necessary resources and capabilities in place to effectively assist in the delivery of the key aviation initiatives outlined below. The Board will make decisions consistent with its responsibilities under the Air Services Act 1995 relating to the objectives, strategies and policies to be followed by Airservices, ensuring that we perform our functions in a proper, efficient and effective manner. The Board will continue to work closely with the Chief Executive Officer to ensure that Airservices has the resources and capabilities needed to deliver world class aviation services to its customers and the community. Our 2015–2035 Workforce Strategy will ensure that we continue to invest in our workforce capability to provide an appropriately skilled workforce to deliver on our service objectives. a. Complete the safe and effective implementation of its recent organisational change program, known as the Accelerate Program (noting the Program is scheduled for completion on 30 June 2017) and undertake a post implementation review of the Program by 30 December 2017; Airservices will complete of the Accelerate Program by 30 June 2017. A post implementation review will be completed by 30 December 2017. A harmonised Civil Military Air Traffic Management System, delivered via the OneSKY program, remains a critical priority for Airservices and we will continue to work closely with the Department of Defence. Airservices will continue to work very closely with CASA in relation to its role as safety regulator for civil air operations in Australia, including on key initiatives such as the OneSKY program. We will do this by proactively engaging CASA through well-established mechanisms and sharing information in an open and transparent manner. As part of Airservices ongoing focus to improve the provision of safe and innovative services for industry, we will actively focus on identifying and supporting opportunities to enhance the level of safety and efficiency of controlled airspace in Australia, engaging with industry and working collaboratively with Government agencies through the Aviation Policy Group and other forums. We will take advantage of new technologies such as ADS-B and identify opportunities to increase the use of Class E airspace in Australia. e. Work with the Department and CASA in the implementation of the agreed recommendations arising out of the ARFFS regulatory policy review; Airservices supports proposed changes for the provision of ARFFS that shifts the current prescriptive regulatory framework to a more risk- and outcomes- based approach. Airservices is actively supporting the Department as it progresses this work and will continue to do so, so that it can harness the service delivery and efficiency benefits that the reforms will enable. f. Work with the Department and CASA in modernising airspace protection policy; Airservices will continue to contribute to and support initiatives that reduce risk to aircraft operations. We will work cooperatively with the Department, CASA, other Government agencies and industry to consider and implement proposals contained in the Department’s Airspace Protection Paper which seeks to modernise airspace protection regulation and identify non-regulatory measures to enhance the safety of aircraft operations. Effectively managing noise complaints through the Noise Complaints Information Service (NCIS). The NCIS provides valuable information services to the community and the ANO. We will continue to appropriately resource the NCIS to ensure that it provides this service to a high standard. Airservices is committed to the 1997 Ministerial Direction relating to the Sydney Long Term Operating Plan to the maximum extent practicable to ensure the safe and efficient operation of Sydney Airport. Airservices will continue to implement our national PFAS management program, including site investigations, in response to Airservices and other organisations’ historical use of aviation fire fighting foams containing these chemicals. Airservices will also continue to work closely with Government agencies in developing a whole-of-government approach to managing PFAS. Airservices will continue to produce and report against an annual environmental work plan which outlines initiatives to manage and monitor the environmental effects of aircraft operations. Airservices will continue to focus on delivering new and improved air traffic services, including performance-based navigation, to improve capacity and efficiency while also improving environmental outcomes. h. Continue to support the Government’s safety and capability building initiatives in the Asia-Pacific region and the Memorandum of Understanding, regarding the management of Australia’s International Civil Aviation Organization responsibilities. Airservices will continue to support the Australian Government’s safety initiatives in the Asia-Pacific region to improve safety outcomes, primarily through working with air navigation service providers in Indonesia and Papua New Guinea to build their capability to manage greater air traffic. This includes progressing sustainable programs that deliver safe, harmonised and integrated outcomes that are aligned with their neighbouring states, including Australia. Airservices works closely with the Department and CASA to ensure that we are executing Australia’s International Civil Aviation Organization (ICAO) responsibilities. a. Undertake effective and ongoing engagement with the community, industry and Government on the development and implementation of significant changes by Airservices to air traffic and ARFFS; Acknowledging that our most important consideration is always the safety of air navigation, Airservices will continue to effectively consult with the community, industry and the Government throughout the development and implementation of any significant changes to our service provision. b. Engage constructively in processes where it can provide information, assistance or advice for policy formulation, implementation and regulation undertaken by Government agencies, both within and outside my portfolio; Airservices will continue to provide information, assistance or advice to other Government agencies, including in the performance of their regulatory and policy functions. • safety outcomes by ensuring aviation safety requirements are recognised in land use planning decisions. Airservices will also continue to engage and consult with concerned community groups through airport-led planning coordination and consultation forums and Airservices technical noise working groups. d. Keep the Secretary of the Department and me fully informed of Airservices’ actions in relation to the requirements stated in this SOE, and promptly advise about any events or issues that may impact on the operations of Airservices, including the provision of timely quarterly reports of progress against the Corporate Plan and advice on the Accelerate Program and the OneSKY project; and The Airservices Board and the Chief Executive Officer will continue to keep the Department and the Minister fully informed in relation to these expectations through regular reporting, including quarterly reports of progress against the Corporate Plan. e. Work closely with the Department, including the Western Sydney Unit, and other Government agencies, including the Australian Transport Safety Bureau, CASA and Defence to deliver integrated and comprehensive safety advice to the Government, the aviation industry and the community. Airservices will continue to support other Government agencies in the performance of their regulatory and policy functions through the provision of timely information, assistance or advice.